When trying to think of what to make for a meal, I often turn to cookbooks. Not so much for the recipes themselves – I have a habit of not following those very closely – but for an idea, an inspiration of something that sounds good and fits the constraints of time, money, and interest. So it was that Thursday afternoon I was flipping through Martha Stewart’s Dinner at Home which Tawn had left out. Two words from that over-ambitious menu leapt off the page: Miso-Glazed. The concept was simple enough: prepare a glaze made of just four ingredients: mirin (Japanese sweet rice cooking wine) or, not having that, sake; rice wine vinegar; miso paste; and sugar. I keep miso paste in the fridge because it lasts pretty much forever and is a handy flavor enhancer. Sake and rice wine vinegar are nice items to keep in the cupboard. And instead of sugar, some maple syrup would add a nice touch. 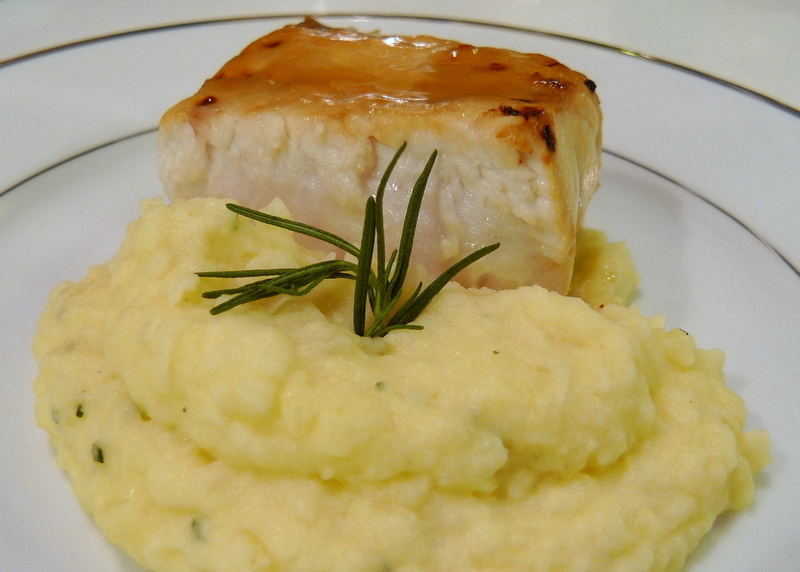 Salmon would have been a fantastic choice of fish, too, but Martha suggested black cod. I went with her suggestion, taking a single good sized fillet, placing it on a baking sheet. To make clean-up easy, I lined the baking sheet with some parchment paper and lightly oiled it so the fish wouldn’t stick. Brush a generous coating of miso glaze on the fish and then put it under the broiler for about 6-8 minute, or until the top is nicely browned and the fish is opaque throughout. I served the fish on top of some mashed potatoes with a chopped salad on the side. I make my mashed potatoes with butter, an ingredient that some people like to demonize but I think a little butter will go a long way to making your potatoes nice. I also added some leftover sour cream and some chopped fresh rosemary to give it a tang and a nice piney aroma. For dessert, an apple cobbler. I used pink lady apples, chopped small with the skin still on. Cooked them in a saucepan for a few minutes with a little bit of sugar, a little bit of water, a little bit of corn starch, and a squeeze of lemon juice. Cook until starting to soften and add a little more water if necessary in order to get a bit of a not-too-thick sauce with the apples. Put the apples into an over-proof dish. 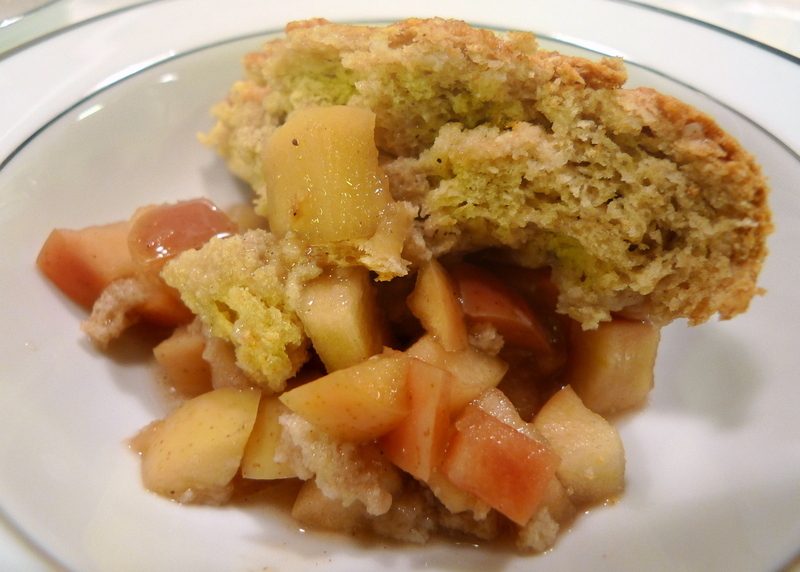 I topped it with a homemade sweet biscuit dough, similar to what I use for shortcake. Flour, salt, baking powder, baking soda, and a little sugar. Cut in some vegetable shortning (Crisco) to the size of peas, and then add either buttermilk (or, if you don’t have that, milk) and stir just until combined. Put the dough on the top of the fruit leaving a few openings for steam to escape. I put a few slices of butter on top of that and sprinkled on some raw sugar for a nice visual. Bake in a 350 F oven for about 25 minutes or until the juices are bubbling and the crust is golden. Serve once cooled to room temperature with ice cream, whipped cream, or just a little pour of fresh cream. Key word here: cream. This entry was posted in Uncategorized and tagged apple, baking, cobbler, cod, cooking, dessert, Fish, food, glaze, Mashed, miso, pink lady apple, Potato by christao408. Bookmark the permalink. I’ve made the decision! I’ll date only those who can cook! OMG, they sound so yummy! It makes me want to go to the restaurant for lunch. I just had a giant sandwich for dinner yesterday, a salmon burger, Italian sausage, and egg. It was yummy too! Yum! I made salmon the other day (no miso glaze) but this sounds very easy and looks mouth watering (because mine is)… I’ll have to go to the oriental market and look for some miso paste. The fish looks very yummy. I may have to try that some time. I could just eat both of those right now – they look delicious. Simple but tasty meals can be just as appetising as more elaborate, fancy ones. And I’m with you on the butter in mash! These are good foods. Chris, I have tried to get Miso paste here, but am unable to. Can you suggest some thing that can be substituted? I should look for it when I go into St. Louis. I always manage to forget that when I go into global foods. @ZSA_MD – Unfortunately, miso doesn’t have a good substitute. The good news is, once you have a container of it, it really survives indefinitely in the fridge so you won’t have to rush out and buy more anytime soon! @Chatamanda – Simple meals are often the most satisfying, agreed! @murisopsis – Plus, miso makes a very satisfying and healthy broth. Unlike many foods, its pH is base rather than acidic, so it can help calm your stomach when you’ve had a little too much acid in your diet. @foggysunnymorning – It was a salmon burger, Italian sausage, and egg sandwich? That sounds huge! =D@Dezinerdreams – It is a good characteristic to look for as it means more time spent at home…@swcheng15 – Very easy – you and Ryan should try it. E, too, once he’s on solids and old enough for fish. @christao408 – hahaha…we just put all the things we had together. Oh, cheese and onion too. You should try using a combination of sugars, white, brown and palm, next time. It really makes for an amazing twist. Also, if you every use a hard fruit, like pears, that you cook for a longer time, try tapioca pearls instead of corn starch. Our friends are actually going there during new years.I would love to go, but I am not sure if it were feasible since I am already going to Taiwan in December. (Thanksgiving to Dec. 5th)Plus they are going to crack dances, which I am not into. @Wangium – And what is a crack dance? Are those what circuit parties are known as these days? Yes sir…well…it’s a slang within our social group…People crack out at circuit dances, hence crack dance. just had apple cobbler with cinnemon ice cream across the street from the st. marys hospital where i was born here in rochester, mn. it is just a few blocks from the mayo clinic where i took training and worked for a few years before my first marriage. your cobbler looks really great i bet it is better than what i had as mine was so terribly sweet. @grannykaren – Oh, I suspect the cobbler you had was served with a heaping helping of fond memories!